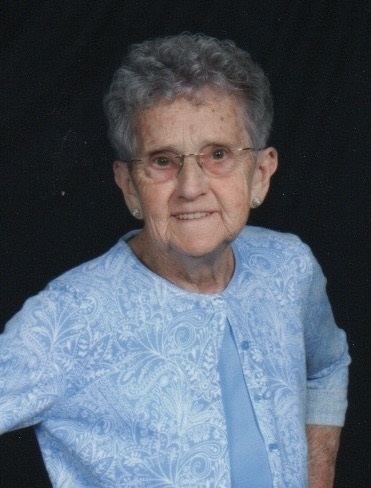 Rosa Graber, 87, of Cannelburg, passed away Tuesday, June 12, 2018 at Memorial Hospital and Healthcare Center in Jasper. She was born December 16, 1930 in Montgomery, Indiana to the late William and Anna (Miller) Wittmer. Rosa was member of the Providence Mennonite Church. She enjoyed working and was employed by O.D. Neff for 27 years and REMC for 10 years. She treasured her family, especially her grandchildren and great-grandchildren. She loved people and never met a stranger. Rosa was preceded in death by her husband, Ervin Graber, who passed away February 5, 1994; father, William Wittmer; mother, Anna Wittmer; step-mother, Fannie Stauffer Wittmer; siblings, Mary (Alvin) Wagler, Joe Wittmer and Amos Wittmer. She is survived by her children, Roberta Graber of Cannelburg, Annetta Graber of Montgomery, Royden (Donna) Graber of Loogootee and Kenny (Connie) Graber of Cannelburg; grandchildren, Amber (Phillip) Smith, Adam (Allison) Graber, Kameran (Zac) Frantz and Kendra (Chad) Stoll; great-grandchildren, Jaxon and Emersyn Smith, Elliot, Fallyn and Willow Graber, Kyah, Zane and Kade Frantz, and Keaton Stoll; siblings, Henry “Hank” (Martha) Wittmer of Montgomery and Wilmer (Dora) Wittmer of Evansville; sisters-in-law, Lily Mae Wittmer of Montgomery and Sue Torr Wittmer of Gainesville, FL and several nieces and nephews. Funeral services will be conducted at 10:00 a.m. Friday, June 15, 2018 at Providence Mennonite Church in Montgomery. Burial will follow in the church cemetery. Visitation will be held Thursday, June 14, 2018 from 2:00 p.m. to 8:00 p.m. at Providence Mennonite Church and Friday, June 15, 2018 from 9:00 a.m. until the time of service at church.